This month sees the finale in a loose trilogy of Sixth Doctor adventures. Companion-less, the Sixth Doctor has been through a lot, there was the betrayal of a friend in The Lure of the Nomad, fought off a dimensional war in Iron Bright and Hour of the Cybermen sees him come up against a lot worse than just those titular metal-meanies. Following on from The Helliax Rift, there had been a shake-up in the UNIT family. Gone were the cosy little unit of the Brig, Yates, Benton, Bell & Osgood, among others and in had stepped a more fearsome crew, something akin to the gang around Bambara in Battlefield. This time it was Colonel Lewis Price, Medical Officer Daniel Hopkins and incoming Captain Weaver. They were more ruthless in getting things done, with the Doctor gone, they had to combat many alien threats without him. The Helliax Rift ended with the Fifth Doctor aghast at what UNIT had become. His substitute companion for that story was Hopkins, played by Blake Harrison. But a lot has happened to Hopkins between that story and this. I won’t mention what has happened to Hopkins but it does influence his actions and beliefs in this story. It also ties into the Cybermen’s plans for humanity. UNIT faced the Cybermen once in the Classic Series on television in The Invasion but those were very different Cybermen. The Eighties saw a big change in the Doctor Who universe, The Daleks were only seen three times, the Fifth, Sixth and Seventh Doctors were completely different to any of the incarnations that came before them and the universe got very dangerous with the deaths of companions, Adric and Peri. Of course, the Cybermen made their Earthshattering return in Earthshock which saw Adric die trying to stop a ship crashing into Earth. The Cybermen had undergone quite a radical change too, their costumes were changed, their faces had see-through chins, allowing the audience to see what was left of the human underneath and they took their orders from the Cyber-Leader and Lieutenant, played by David Banks and Mark Hardy. It is these Eighties Cybermen who feature as the villains of Hour of the Cybermen, this time not voiced by Nicholas Briggs but their original actors. And it is really wonderful. They don’t sound exactly like they did, the new ring-modifier probably saw to that, but they are unmistakable as the same characters. The funny thing about this pair was always whether the Leader was as unemotional as his minions as he took perverse pleasure in making Tegan watch as the freighter hurtled towards prehistoric Earth to destroy it. That question comes into play once more as David Banks returns, this time with a slightly more sadistic Leader, especially in a scene between him and Russ Bain as Price. Their plans are equally as sadistic which sees them removing the water from the human body as a way of forcing humanity into submitting to their conversion. These are definitely the gloriously violent Cybermen from Earthshock, Attack of the Cybermen and Silver Nemesis. Blake Harrison puts in a tremendous performance as Daniel Hopkins once more and it goes to show what a terrific actor he is. Never having seen The Inbetweeners, I had no idea who he was before The Helliax Rift but he was so great in that, that I couldn’t wait for his return in a few months time. It will be interesting to see where the continuation of his character goes too when he hopefully returns in November’s – Warlock’s Cross. Colin Baker has been companion-less for the last three audio adventures and it has really allowed people to see how great his Doctor really is. Big Finish has worked its magic so well with the Sixth Doctor allowing the BBC and the audience to see the full potential of the Sixth Incarnation. Colin Baker is superb, as always and it is wonderful to hear him come up against the proper Eighties Cybermen again. The guest cast is on fine form too, particularly Frog Stone as Riva and Wayne Forrester who plays the dual role of Atriss and Captain Weaver. Both actors are tremendous, Weaver feeling a little more like the Brigadier of old which was quite nice to hear. Riva would have made an excellent companion for the Sixth Doctor, hopefully, this isn’t her only performance. The script from Andrew Smith is excellent too. He seems to really shine when he brings back old adversaries like the Sontarans, Marshmen, Voord, Voc Robots, Movellans & Daleks. Now he gets a turn at the Cybermen and they are equally, if not better, as good as they were on television. Hour of the Cybermen is perhaps the metal-giants at their most sadistic and cruel and Smith realises that beautifully as well as continuing the UNIT story, especially that surrounding Daniel. This is another triumph for Smith. Hopefully, there is more from him in the near future. Everything about Hour of the Cybermen allows the story to stand tall and proud, I would definitely rank it as one of the best Cybermen stories told by Big Finish. It is delightful to hear David Banks and Mark Hardy return and this had better not be the last we hear from them either. Jamie Anderson’s direction is top-notch, he has quickly become one of Big Finish’s best directors and he gets the best he possibly can out of his actors and script, long may he continue too. 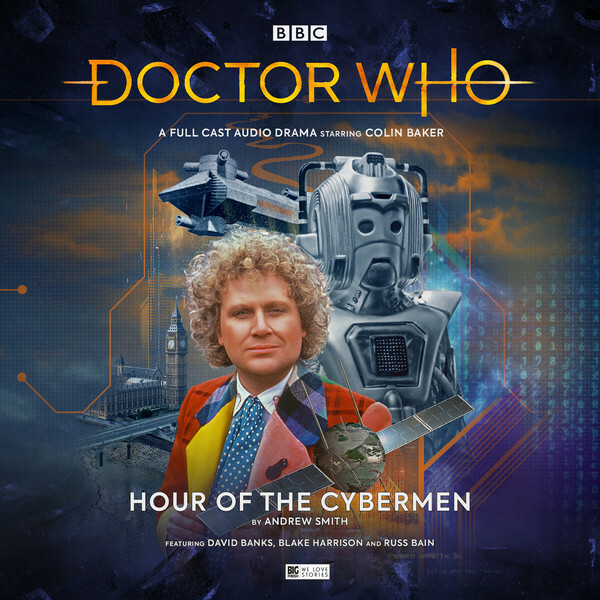 Hour of the Cybermen wraps up a successful trilogy for the Sixth Doctor and it will be nice to hear more solo Six later on down the line. I’ve never been a fan of solo Doctor adventures but this trilogy may have just changed my mind, so well done Big Finish! And I love the new covers with the brand new logo on! Just look at the Big Finish page for some of the upcoming releases, they are stunning. Well done to everyone involved. In fact, one might say, EXCELLENT – (in booming Cyber-Leader voice)!